We are currently working on a file to introduce flags on this track. We will release it shortly. Our skin makers are creating some new wonderful skins day by day. We will keep you updated. a nice video created by Giancarlo to get in the right racing mood! tonight we are going to use our forum chat. We will have 2-3 servers for the prequalification. you can choose any of them. I enjoyed this race very much. looking at my lap history you can tell I had great fun at the beginning of the race! I gained 6 positions in the first 9 laps having nice and extemely clean battles with all the fast guys in front of me! I was amazed about my pace! Then I did a comical mistake: I hit the wall on the main straight all alone. how? easy: I wanted to remove my sweater because it was too hot! I removed my headset before the Aeu Rouge and I tried to remove as fast as I can the sweater. I tryied to be in the middle of the track, trying to look between the fibers of my sweater, but... I touched the steering wheel with my arm and.. crashed on the wall! What a pity! it was a great race until that moment! Overall I was really happy about the race: all of us had a great, clean start and we were more or less all pretty close for a lot of laps. I've to say it's that endurance races are really a wonderful experience. You see a driver few seconds in front of you and you know that you will have a lot of time to go to catch him. You just need to keep the concentration. Not easy at all for all those laps! At the end you are really tired and it's not easy at all to be consistent for almost 2 hours. Congratulations to Mario, Stephane and Robert for their great achievement. First at all thanks to Andrea and others that I could quickly enjoy in such amazing race! I had lot of funn here and if I can - and you allow, I will participate next time again if the races ar at weekend! I hope I didnt desturb eny driver the pace, I have let pass every driver when I become the free chance! I think it was 3-4 of them, since I was one lap behind! The qualy was very fine for me and I didnt expected to drive a 2m14 time in this short time again! I started at 4th place and toulk emidietly the 3th and hold it 14 laps until I runn out of fuel in the entry of the pitlane! It was just 100m or so and I needed half liter or so to arriwe my pit! I didnt prepare my self before tha race about the fuel consume than in this case I would manage my driving style better and that was my mistake! So the only thing was to finnish the race the "ESC" button! I knowed that I would lost one lap but I want to finnish the race here and have funn with all of you! The rest of the race was fine and almost quiet, ok I had some spined cars on very difficult parts of the track in front of me that I have to pass without crashes (lucky!) and drowe the whole time without eny great mistake, no spun, noe grass or enything elese! Shame for that fuel accident, then I had a very good pace and for shure I would finnish the race in some front, maybe 2th -4th! Enyway I am happy to score some good points, funn and experience! I must say I like such sort of races with pitstops ec, more than without! It gives more space for experiments, taktics ec.! Further I must give a great compliment to the old F1 car skinner team! (Mario and others!!) Wow! Amazing work! I loved my Benetton car! I feeled as a young Schumacher in early days! Congrats again to the winner Mario Gilles -amazing speed- and naturly for the rest! con distacchi risicati tutti molto vicini. possibile a Vito, ma lui era un pelino più veloce è avrei dovuto rischiare un po. La differenza l'hanno fatta i consumi, Vito si è fermato due giri prima di me e da lì ho avuto vita facile, il problema è stato rimanere concentrato. e mi avrebbe fatto compagnia fino al traguardo. tutti e dico tutti sono stati corretti. participants in the event durations. detachment narrow all very close. possible to Vito, but he was a Pelino the faster I would have to risk a bit. and I would have made the company until the finish. tell everyone and everyone has been corrected. My apoligies once again to Daniele. 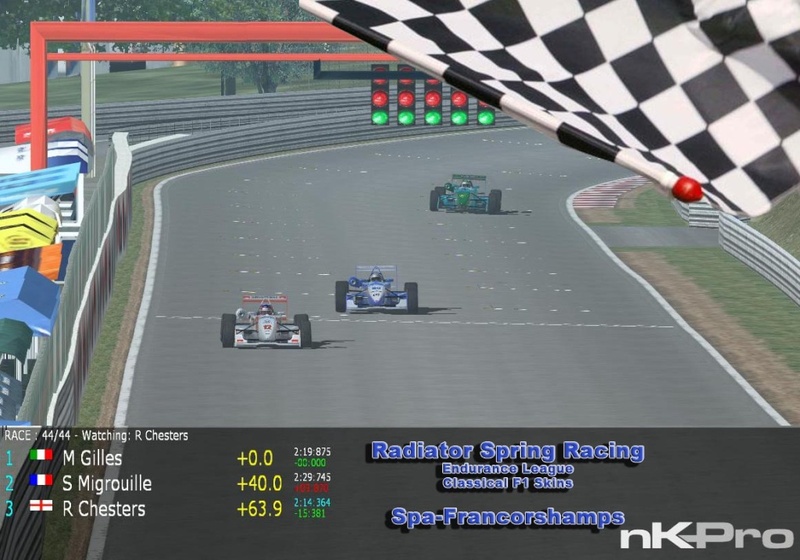 I was 1 lap down when I saw the blue flag and I gave road to Vitaliano. Then, I saw one more blue flag waving. I quickly looked into the mirror and unfortunately I've pinched the grass with my right tyre and spun. Daniele couldn't do anything to avoid me. I'm really sorry for ruining your race, Daniele, because you were few seconds from with Vitaliano fighting for very a good position. I was doing my best not to create trouble to anyone on track, since I was 1 lap down after my "sweater error", but unfortunately I did a small mistake in the worst moment! It was an exceptional race. I was very lucky to finish 2nd. Ftarget is the car I most difficult to drive and for me the only strategy was to be careful throughout the race. A poor rating with the 10th time. I missed my start and I ended up 13th at the 1st lap. I worked hard on my 2 pit stops with only 1.5 liters of fuel remaining. The slightest error could have had fatal. Then throughout the race I realized that I won some position on the mistakes of others. The 2nd stop was a great relief and freed me of a concern. I only had to concentrate on my driving and not of my tank. When I saw that I was 2nd, I could not believe my eyes. It only remained to continue with my best friend still in the race. "CAREFUL". My heart is mounted to 200rpm ! Fortunately I was able to reach the finish line. Congratulations to Mario and thx to all for this great event. E 'stata una gara eccezionale. Sono stato molto fortunato a finire 2nd. Ftarget è l'auto che più difficile da guidare e per me l'unica strategia era quello di stare attento per tutta la gara. Una qualificatione poveri con il tempo 10. Ho perso il mio start e ho finito 13 ° al 1 ° giro. Ho lavorato duramente sul mio 2 fermate ai box con solo 1,5 litri di carburante rimanente. Il minimo errore avrebbe potuto avere esito fatale. Poi per tutta la gara mi sono reso conto che ho vinto dei positione per gli errori degli altri. La fermata 2nd è stato un grande sollievo e mi ha liberato di una preoccupazione. Ho solo dovuto concentrarsi sul Condotta e non del mio serbatoio. Quando ho visto che ero 2nd non potevo credere ai miei occhi. Non restava che continuare con il mio migliore amico ancora in gara. "Prudenza". Il mio cuore è montato a 200rpm ! Fortunatamente sono riuscito a raggiungere il traguardo. Congratulazioni a Mario e grazie a tutti per questo grande evento. The pressure was on, that's for sure! Very nice smoothy race ..I was made lot of error in this race first one press esc..and don try to comeback on box in track..after I crash on the exit of the box ...but was ea really HARD driving for 44 laps..Big Challenge. Overall a very enjoyable event. hope come soon the next Long Challenge whit this "Great" Grid. Someone have a "long" full Replay?? All 44 laps?? It's really true that races are not finished until you cross the finish line! Giancarlo Graziano wrote: Someone have a "long" full Replay?? All 44 laps?? I like very much long races and I really hope we'll make it a fix appointment (I really would like to have a long races league, of course with F3 (the car I like more) or at least with F2000 (I much prefer winged cars). I started very well and gained 4 places in the first lap then I chased Zoltan but after some laps I did a mistake at first turn and I had to pit stop to repair the car. When I got out from the pit I tried to push to recover positions but I had my second crash at fast double left hand turn (sorry... I don't know its name) and I lost very much time. Because of crashes I couldn't follow my strategy and I had to pit twice again (so in total I did 4 stops while I had to do only 3). To be honest my race was a little disaster and from timing I saw that I could really reach the podium instead of finish 4th at a minute and half from first... but I really enjoyed the race.